NMM, MO2, and Vortex Friendly! Ever wanted to choose which headgear you wanted to hide instead of being forced to hide none or hide them all? Well I have just the mod for you! Welcome to Helm Hider - PYO (Pick Your Own). 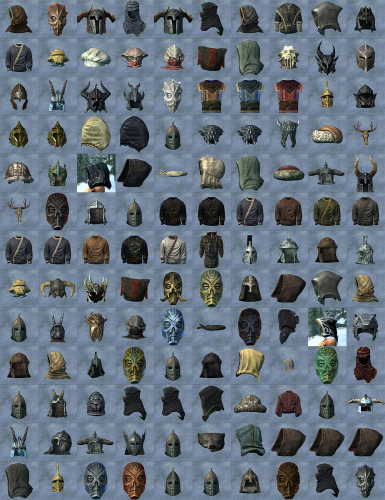 NMM FOMOD friendly with included images and descriptions of all Headgear (excluding circlets). Updated FOMOD to work with NMM, Vortex, and MO2. Ever wanted to choose which headgear you wanted to hide instead of being forced to hide none or hide them all? Well I have just the mod for you! Welcome to Helm Hider - PYO (Pick Your Own). NMM FOMOD friendly with included images and descriptions of all Headgear (excluding circlets). Helm Hider also comes with several flavors to choose from. All Hidden - Hides All Headgear, including Headgear attached to Outfits. Include Helm Hider Support for Armour Mods.